Arunima Sinha, the Indian mountaineer who became the world's first woman amputee to climb Mount Everest in 2013, has been awarded an honorary doctorate by a prestigious UK university for her inspirational achievements. "I'm very happy and grateful to receive this honorary degree from the University of Strathclyde. This award delivers a good message to the youth of India and the world over that if you strive to reach your goals in life your achievements will be recognised," Arunima Sinha said. While recovering she resolved to climb Mount Everest and later trained with Bachendri Pal, the first Indian woman to climb the world's highest peak. 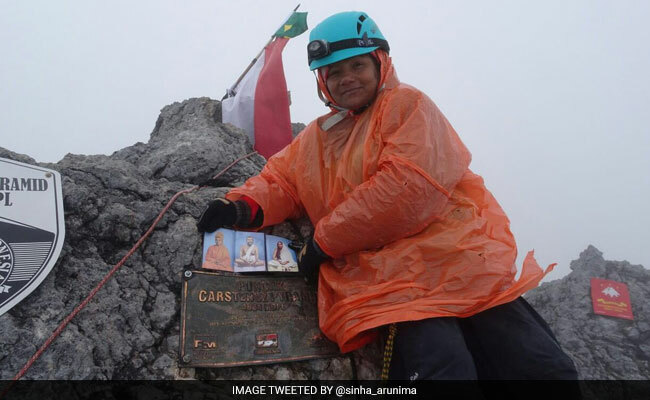 On May 21, 2013, Arunima Sinha became the world's first female amputee to climb the 8848-meter peak. In 2015, she was presented with the Padma Shri, India's fourth-highest civilian award. "Arunima is an inspiration to amputees around the world. Not only has she shown real spirit, courage and determination in overcoming adversity, she is using her compassion and positivity to help other people," said Professor Jim McDonald, Principal and Vice-Chancellor of the University of Strathclyde. "Arunima embodies the values of Strathclyde and we are delighted to recognise her achievements by making her an Honorary Doctor of the University," Professor McDonald said. The award also recognises Ms Sinha's charitable work through the Arunima Foundation, which seeks to empower women, disabled people and generally improve the health and social and economic situation for poorer communities.